Symptom: Randomly kicks out balls into shooter lane. When playing the machine, occasionally a ball would be kicked up from the ball trough and then launched into play. This would happen mostly during multiball when an additional ball wasn’t supposed to be launched, but I witnessed it once during single ball play. There are a couple of automatic functions working regardless of the state of the game. The first is when the Trough Eject opto is blocked (switch 31 on the matrix), the machine software will kick up another ball from the trough. The second is when a ball is sensed in the shooter lane, and it’s not the initial ball of the turn, the ball is auto-launched into the playfield. So, a false signal on the Trough Eject opto during play will cause a ball to be kicked up from the trough and launched into the playfield. After checking that the optos were functioning properly and reflowing some solder joints, the problem still existed. After playing the machine some more, the owner discovered it was related to the flippers. Intense flipper use would cause a ball to be ejected and launched. This also explained why the problem was more prevalent during multiball, because the flippers were being used a lot more. This is very similar to the WPC flipper reset problem, but instead of reseting the machine, it would kick out another ball. We were able to verify this in the Switch Edges test. Hitting both flippers at the same time would cause the column of optos, switches 31-37, to momentarily go away (with no balls in the machine). At this point, the problem was easy to reproduce. The signals for the optos are processed by the 16-opto Switch Board Assembly (A-16998). The board is powered by the unregulated +12V supply circuit from the Power Driver Board. The oscilloscope revealed that the +12V power was dipping during heavy flipper use. This was expected since it’s not regulated. However, on the Opto Switch Board, there is a diode (D19) and a filter capacitor (C6) to filter out transients and dips in the supply voltage. 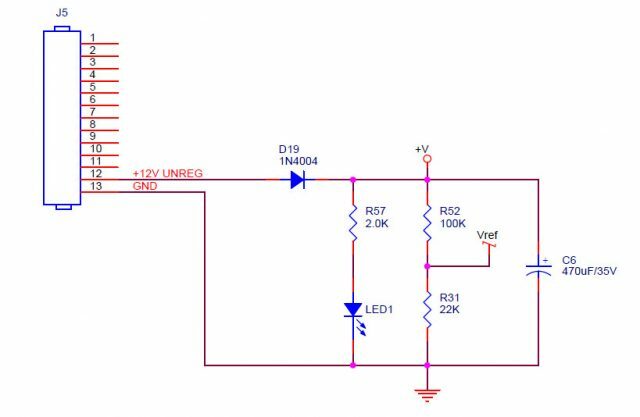 The important part of the circuit is the Vref (reference voltage) generated by R52, 100K and R31, 22K. This signal shouldn’t have a lot of variation or electrical noise. But the oscilloscope revealed it did. My first choice would have been to replace C6, but I didn’t have a suitable replacement with me. But since Vref is the most important, I added a 22uF capacitor across R31, the 22K resistor. This fixed the problem. This same circuitry is used on the 12-Opto Switch Board and the 10-Opto Switch board (and probably others) used in other Williams pinball machines of this era. The component designators are different on the other boards, so look at the schematic for the matching circuit as shown above. Look for the power coming into the board and going to a diode. If you’re having this problem, replace the main capacitor (C6 in the diagram above) and if that doesn’t help, add a 22uF capacitor across the 22K resistor. Symptom: Game not playing correctly, one string of lights out, eddy current sensors needed adjustment. I fixed some of the easier stuff first, such as adjusting the eddy current sensors and fixing the string of lights that was not working. As for the lights, the driver transistor was good, but found a bad solder joint on U19 (ULN2803) on the Power/Driver board. The game didn’t play correctly. Most often when completing an illusion, the countdown timer would stop and the game would never finish the illusion. It was falsely saying the Secret Ball Lock was locking a ball. Mulitball would falsely start, but since there were no balls actually locked, it couldn’t really have a mulitball. After two balls were locked, the magic trunk is supposed to spin around and show the target (magnet) face, but instead would spin to the side with the light on it. Yet everything in the diagnostic tests worked just fine. My experience with other Bally/Williams machines has shown that when a game is not playing correctly, there is something wrong with one of the switches either not registering when it should, or registering when it shouldn’t. (It’s the old computer adage “Garbage In, Garbage Out”.) The question is which one (especially when all of the switches work fine in diagnostic mode)? After taking a close look at the rulesheet, I was able to narrow down all of the symptoms to just one optical switch that was triggering when it shouldn’t have: The magic trunk rear entrance (a.k.a. subway switch #36). One of the key points in the rulesheet is that anytime the machine senses the ball going under the playfield, the countdown timer will stop until the ball resurfaces. The other key point was that if the ball enters the rear of the trunk when the Lock light is not lit, then you get the Secret Ball Lock. The ball had never gone into the rear entrance when testing. Switch #36 is an optical switch (opto) that triggers when the ball breaks a beam of infrared (IR) light between the transmitter and the receiver. I measured the voltage across the photo transistor (receiver) and measured about 5 volts. 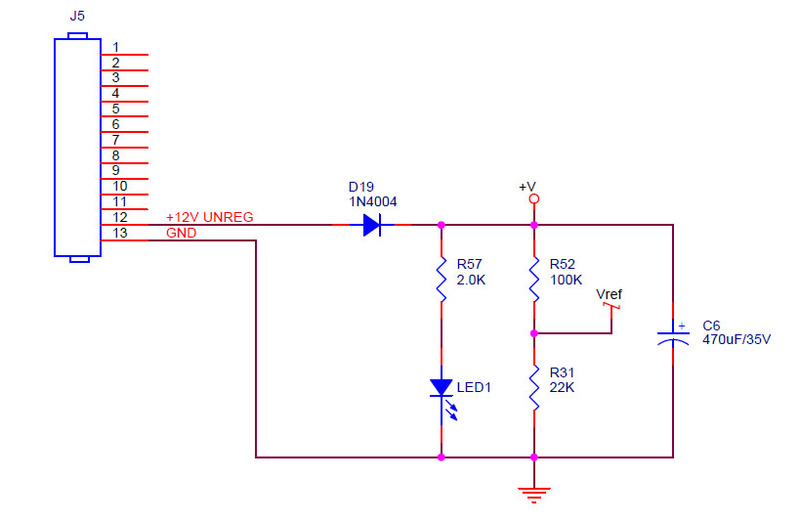 The voltage should be either below 1 volt (opto unblocked) or around 12 volts (opto blocked). This told me that not enough infrared light was reaching the receiver (btw you can’t see this IR light with your naked eye). I cleaned both the transmitter (LED) and the receiver to see if that improved anything, and it didn’t. 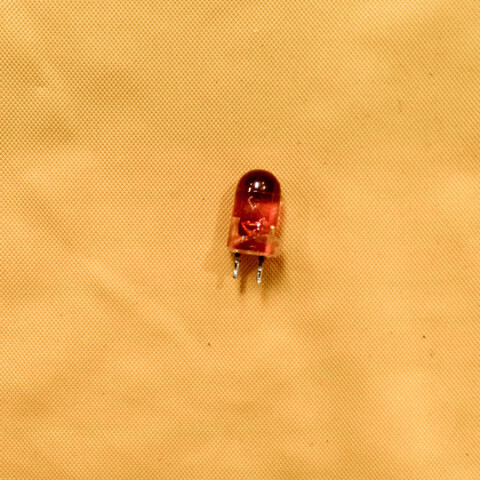 With optical switches, the IR LED is usually the component that fails. I tested the LED with an IR detector and it showed it was emitting light. I went ahead and replaced the LED anyway. Bad infrared LED used in optical switch located at the rear trunk entrance (subway). I installed the transmitter board back into the machine and measured the voltage across the receiver. This time it measured 0.2 volts, which is a huge improvement, down from the 5 volts measured before the replacement. I knew at that moment the game was fixed. Even though the old IR LED was emitting light, it was not enough light. And the receiver was sitting at a voltage that was right on the threshold. So all it took was some minor voltage fluctuations during game play (fluctuations that were not present during the diagnostics) to falsely trigger the switch circuit. "Randy just left here and after over 20 years I now have a jukebox that works." --Jeff, Aurora, CO.
"Randy is always very professional and extremely knowledgeable about the work that needs to be done. He is the best out there that can be found for pinball and juke box repairs." --Larry, Sidney, NE.